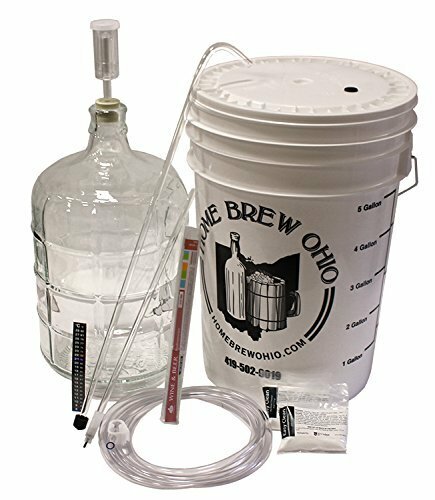 This 3 gallon home wine making equipment Kit contains the following - glass: 3 gallon carboy glass 6.5 gallon fermenter with lid that accepts airlock bottle filler with auto-shut off - 3/8 inch hydrometer - dual scale thermometer - adhesive thermometer 24 inch racking cane - 3/8 inch 5 feet of Siphon hosing for transferring the wine - 3/8 inch Siphon hose shut off clamp - 3/8 inch airlock drilled rubber stopper for carboy, 2 - 4 ounce packages of Sterilizer., includes 3 gallon glass carboy, 6.5 gallon fermenter with lid that accepts included airlock, versatile equipment Kit, country of origin - United States, manufacturer name - Winemakers Depot. If you have any questions about this product by Winemakers Depot, contact us by completing and submitting the form below. If you are looking for a specif part number, please include it with your message.